Plot When an everyman, in a loveless marriage, finds out that his wife is cheating on him, he starts to blackmail both his wife and her lover, which sets off a chain of events, resulting in a murder, involving people, who are looking at their personal gains. Abhinay Deo gave us the delightfully funny dark comedy in the form of Imran Khan-starrer ‘Delhi Belly’ way back in 2011, and we still remember the innuendos mouthed by the lead actors of that film whenever it is talked about today. But such is not the case with his recent outing ‘Blackmail’, which despite featuring powerhouses of talent, falls flat on its face. Its suspense goes for a toss once a mishmash of the script begins to unfold on the screen. 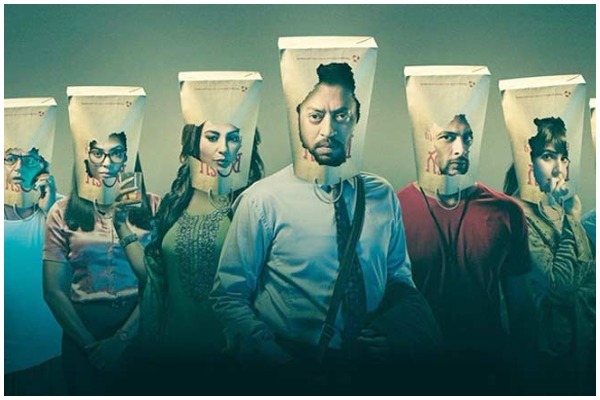 ‘Blackmail’ is the story of a common man Dev Kaushal (Irrfan Khan), who sells toilet paper rolls (who uses these in India anyway!) to make a living. He is an everyman, caught in a loveless marriage but still happy with his odd job, a quirky boss and supportive colleagues. He stays late in his office to play games on the computer, reluctant to leave and also fantasizes about other women and uses the same rolls he sells to satisfy his other needs! Once, one of his colleagues advises him to surprise his wife Reena (Kirti Kulhari) by being home early, so that the spark of romance between them can be kept alive. Taking heed, Dev reaches home with a bouquet, only to find his wife in bed with her paramour Ranjit Arora (Arunoday Singh). Heartbroken but not enraged, Dev decides to take situations in his ‘own hands’ and exact revenge! Baaghi 2 Review[2.5/5]: Tiger Shroff, Disha Patani Starrer Doesn’t Let Out A Mighty Roar! Dev starts to blackmail his wife and her lover to get even, and then on starts a chain of blackmailing, each one pursuing the other for his or her own personal gains. What follows is a funny story of revenge, murder and suspense, which avid suspense-thriller fans can guess way before it even starts to open out. Deo’s film falters at many points. The script, penned by Parveez Sheikh, is not crisp and it gives away the plot too easily. One does not get to enjoy the proceedings and the drama, which is quintessential in a suspense movie. The screenplay, too, is not up to the mark. Had the screenplay been a bit racier, the story would have automatically picked up pace, making it more enjoyable till the end. The dialogues, which are laced with toilet humour, are nothing out of the ordinary, though some do make us laugh out loud. Songs are unusual but forgettable. And sadly, Urmila Matondkar’s Bewafa Beauty, too, does not having a lasting effect. The first half drags and the film quickly races into the second half. As for the acting, Divya Dutta and Arunoday Singh do not have enough scope to showcase their talent and same goes for Pradhuman Singh (remember the Osama bin Laden-lookalike? ), who otherwise can set the screen on fire. Divya Dutta plays Arunoday’s eternally-drunk, rich wife, who loves to call him Tommy, while Singh plays a man caught between his wife’s wealth and his lover’s lust, which could have been portrayed by almost anyone in the industry. Omi Vaidya disappoints with his act bordering on annoying rather than funny. Kirti Kulhari, who wowed us with her superlative performance in ‘Pink’, is not in her element (and she is not to blame). Her character is not well-etched and her interpretation of a wife cheating on her husband comes across as plain ordinary. The best part of the film however, is the versatile Irrfan Khan, who carries the otherwise sinking film on his shoulders. He sports a deadpan expression all throughout the film; he walks in and walks out of every frame looking dazed and confused and that is what brings on the laughs most of the time. Even when he walks in on his wife having an affair with another man, he is neither rankled nor raged. His act is the only saving grace of the film. To sum it up, Abhinay Deo’s ‘Blackmail’, which is good only in a few parts, is not worth the time and energy. Next : BREAKING: Salman Khan Gets Bail On Blackbuck Case After Spending Two Nights In Jail!